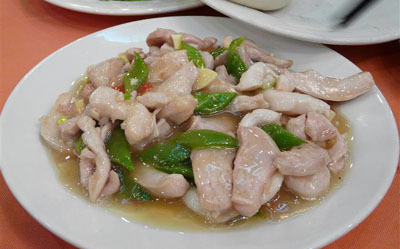 A restaurant with a history dating back to imperial times, Tong He serves traditional Shandong cuisine. Shandong province is on the sea so seafood is big here, and salty flavors predominate. Sea cucumbers are a favorite in Qingdao and other ports of Shandong; they are supposed to work wonders for male performance, presumably by a kind of sympathetic magic. You can try them here with onions. Get some relief from the saltiness with a kind of thick, sweet egg custard called san bu nian (三不粘).